When I was invited to review the new cookbook, Let’s Eat, A Cookbook Celebrating Film, Food & Family by TV legend Margaret Pomeranz and her daughter-in-law Philippa Whitfield Pomeranz, I had my doubts. I’ll admit that I was a bit skeptical because I saw these two woman as high flying celebrities and not women who could be up to their ears in potato peelings. I received the book along with one to give away a few weeks ago but only had time to sit down and read it the other day. Once I opened the book and read the first of 8 chapters, I was hooked. I took the book to bed. It’s part cookbook, part memoir, part family, part films and completely wonderful. I don’t review a lot of cookbooks because there aren’t a lot of cookbooks that I love. This cookbook was written by both Margaret and her daughter-in-law and they get along really well. What sets Let’s Eat apart from other celebrities and celebrity chefs is that this is family food – dishes you or I would make at home for our families and close friends. There are no difficult to source ingredients, no need for a fancy smoker to puff through our mashed potatoes and nobody’s going to ask you to sit your food on a piece of burnt wood. I didn’t arrive in Australia until 1994 and Margaret and David Stratton had been doing their The Movie Show on SBS since 1986 so I played catchup. I’ll admit that I found David often a bit too much and I found Margaret’s enthusiasm tough to keep up with but I kept watching. Each movie they gave a good review to, I wanted to see. That’s the point of the show, obviously. Let’s Eat has 80 easy to make recipes that while not 100% healthy are definitely on the healthier side of the kitchen table and each recipe is beautifully photographed and sprinkled with memories of family life. Philippa is a producer and director who is married to Margaret’s son Josh and she truly loves her mother-in-law. Who wouldn’t? Margaret is a woman on the go and a house that’s always filled with family and friends. 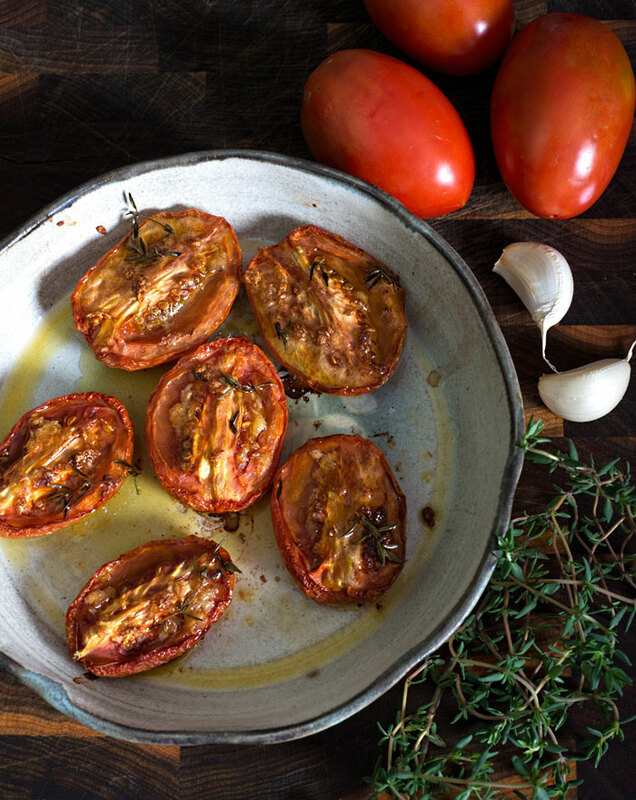 I chose an extremely simple recipe to make but it’s one I love – slow roasted roma tomatoes. It’s a perfect side dish or as I like to do, put it on a piece of baguette and hope I don’t spill it all over my shirt. The finished tomatoes are so smooth and juicy you could spread them on toast. Balsamic Beef, page 158. Cooked very rare, sliced and drizzled with balsamic vinegar. Chicken and Mushroom Pot Pie, page 163. This pie is filled with chicken garlic and mushrooms and topped with puff pastry. Baked Brie with Honey, page 65. This is from Pip and it’s an American recipe that’s so easy to make and beautiful to eat. Sticky Chicken, page 110. Chinese five spice and honey are all I needed to read to know this recipe is mine. Barbecued fajitas, page 130. I love fajitas whether they’re cooked on the bbq or on a grill pan – don’t forget the tequila. One person can win a copy of this cookbook by telling me your favourite movie and I’ll put your name in a hat. I don’t care where you live but the measurements are in grams so you’ll need a scale. Ooh I saw this book the other day and thought it looked interesting. Fave movie? The Princess Bride. I think I’ll have to buy this if I don’t win it. Sounds like my kind of book! Favourite movie is ‘Out of Africa’ of course. Thanks for sharing your thoughts on this cookbook. It looks like a good one! I mostly eat vegetarian, but I suspect that there would be some good vegetarian recipes in the book. In any case, it looks like a lovely book! Oh, got a lovey any book that tells us how to do slow roasted tomatoes – one of my favs and such a great way to use the excess tomato crop. Will have to look out for this. Maureen, what a great book review! Your honesty is always refreshing to me. And I am so comforted to see you share such a simple Italian side-dish. Makes the rest of us feel okay sharing our simple fare. Simple is often best, isn’t it? My favorite movie is one I watched recently, and it has to do with food (go figure): The Hundred-Foot Journey. If you haven’t watched it, you must! I have a feeling you’d love it. What a fun cook book, Maureen! If the other recipes are as tasty as the slow cooked tomatoes I’ll have to read it! Sounds like a great cookbook! And these tomatoes look so good. I love how roasting them brings out their depth and sweetness. I love slow roasted tomatoes too! Thanks for another great cookbook review. That photo is delightful. And yet again, the frequency you post continues to amaze me – what energy! I find every other day works for me. The ones who can post every day will never see me in their ranks. 🙂 I also don’t have a big facebook group and another website to build like you are. Hybrid cookbooks are some of my favorites–I really do love the idea of getting more out of a cookbook than just a simple set of recipes; stories are just as important. Thanks for sharing this wonderful cookbook + recipe, Maureen! Oh yum, I love slow roasted roma tomatoes!! The photos in this post are really beautiful! My favourite movie is The Prestige. I can watch it over and over again. Sounds like a fun book! Although I had to Google the authors. 🙂 Slow cooked tomatoes have such great flavor, don’t they? And the only way to deal with out-of-season tomatoes (even if they’re “ripe”) IMO. Thanks for this. These two did a movie review show for many years. He was stiff and occasionally pompous and she was a firecracker. I love Margaret and her infectious giggle – they were such a great duo although sometimes I wondered if they saw the same movie. Gorgeous photos Maureen – I’m a squisher too when it comes to roast tomatoes and I never fail to get juice everywhere. I watched Margaret and David from time to time… glad they have retired now. What a prize for one of your lucky readers! Loved both David Stratton and Margaret Pomerantz forever . . . actually personal preferred David who taught me many a thing! Had heard of the book and have to do serious homework since three dear blogfriends are about to come out with their own volumes I just have to get 🙂 ! My favourite film of all time : Denmark’s priceless Oscar-winning ‘Babette’s Feast’ from somewhere in the 80s, even if I am dating myself!!! At my age, it’s nice to see people dating themselves. I don’t feel so alone. ? Maureen, I just hope that people who liked the duo do NOT regard them as ‘retired’ as both still work in the public eye consistently : oft in the tertiary sphere . . . Mr Google, as always, can be of great help . . .
People in their 7 can still make a great contribution! Looks to be a great cookbook Maureen that I saw just the other day! Who can go past the aroma of slow cooked tomatoes and their versatility! Good review and enjoy today! I like cookbooks that in addition to recipes, also provide stories! These slow roasted tomatoes look fabulous Maureen…so simple and yet loaded with flavors…thanks for sharing the recipe. I used to love watching David Stratton and Margaret Pomerantz too. I think I’d also love this cookbook. I am definitely going to try the slow roasted tomatoes. It’s hard to pick a favourite movie. I loved One Flew Over the Cuckoo’s Nest (and that definitely dates me!). I remember I left the theatre crying my eyes out. A little more recently, I also loved The Neverending Story. Took my boys to see it many years ago, and still enjoy rewatching it when it comes on TV. Gorgeous photograph of slow roasted tomatoes! As others have mentioned, I favor cookbooks with more than recipes, and by your account, it seems the ladies have accomplished just that. My favorite motion picture rests with Bette Davis: either “Jezebel” or “All About Eve”. Great review, Maureen! Thanks for sharing maureen. What a gorgeous book…it touches my hearth right there in the title! I haven;t come across a whole lot of books that were “part cookbook, part memoir, part family, part films ” – this sounds so interesting – almost like “Hindi Bindi Club” which was part fiction, part cookbook! It’s hard for me to pick an absolute favorite movie – there are so many. I’ll pick the first movie I ever saw in a theatre – The Sound of Music. What did you think of the movie Australia? I really loved it – so quirky. Thanks for the opportunity! Tomato season should soon be here. I for one can’t wait! These look awesome! Oh, you did a great job on these tomatoes and I can almost taste them from here! I have a few movie favorites but I have watched Gone With The Wind so many times and never tire of it. I did just watch Julie and Julia which was a good show. Fave movie, wow… that is too hard to decide, can I do top 3? The Lion King, Blood Diamond & Only You. I know! Turns out she shares what she and her family eat and it’s remarkably like what you or I or anyone would make. I loved the book. It looks like one to have in the collection. Beautiful pictures Maureen. Simple but definitely a flavor favorite, I love slow cooked tomatoes! the books sounds interesting and it’s in grams (yay!). Ok… eam… Gladiator the movie! I really miss watching At the movies – margaret and david were my go to advice when I wanted to choose a movie. That laugh! I was intrigued to hear margaret had written a cookbook so am really pleased to hear it is good – I’d love to go into the draw if it is still open – though choosing a favourite movie is always tough – I think Wonderland (directed by Michael Winterbottom) is probably the one though I could name 20 others easily. favourite movie? So very many, but as a teeni n the eighties, The Breakfast Club still has my heart. Babett’s Feast would be a close second, but it’s been years since I’ve seen it. A true foodie’s movie. Beautiful recipe – Perfect for the start of Spring. I look forward to making this.